Keen-of-mind inventor and innovator Clarence Leonidas Fender, more commonly known as Leo Fender, was born on August 10th 1909 in sunny Southern California. Raised by the owners of a lucrative orange grove, Leo dabbled with electronics at an early age showing insight and promise. By the ripe old age of 13 years he had developed a passion for working with radios and soon thereafter established a radio repair shop out of his parent's home. Later, while in the process of studying to earn a degree in accounting Leo Fender continued to educate himself in the area of electronics although never participating in any formal education in the field. Years later after suffering the economic blows of the depression era and losing several jobs, Leo Fender started his own radio repair shop by the name of "Fender Radio Service" and was later contracted to build a number of PA systems for local musicians and band leaders. He later opted to join up with a man by the name of Clayton (Doc) Kauffman who was an inventor himself as well as a lap steel guitar player. Kauffman, while working with Rickenbacker, had invented the "Vibrola tailpiece" or what eventually came to be known as the vibrato or tremolo. Fender and Kauffman eventually united to form a new company by the name of K and F Manufacturing Corporation and they set out together to build amplified Hawaiian guitars and amplifiers. Many years later and after the design and production of many now-famous instruments including the Telecaster and the Precision bass, Leo Fender sold his beloved company to CBS for $13 million dollars. And although he passed away in 1991 and never learned to play the guitar himself, Leo Fender has left a lasting impression upon the music industry the likes of which will never be forgotten. The FR-50 features a beautiful laminate Spruce top with laminated Mahogany back and sides. The rounded neck is comprised of Nato which is an inexpensive reddish-brown wood known for its strength and durability. The fingerboard is composed of Sonokelin which is an inexpensive variety of Rosewood and the nut is made from the miracle substance known as Tusq. The bridge is referred to by Fender as a Split Saddle and is composed of a material called Micarta which is a composition of various materials including paper, linen, and fiberglass which go through a process known as thermosetting which hardens the materials and makes them of use in various applications. 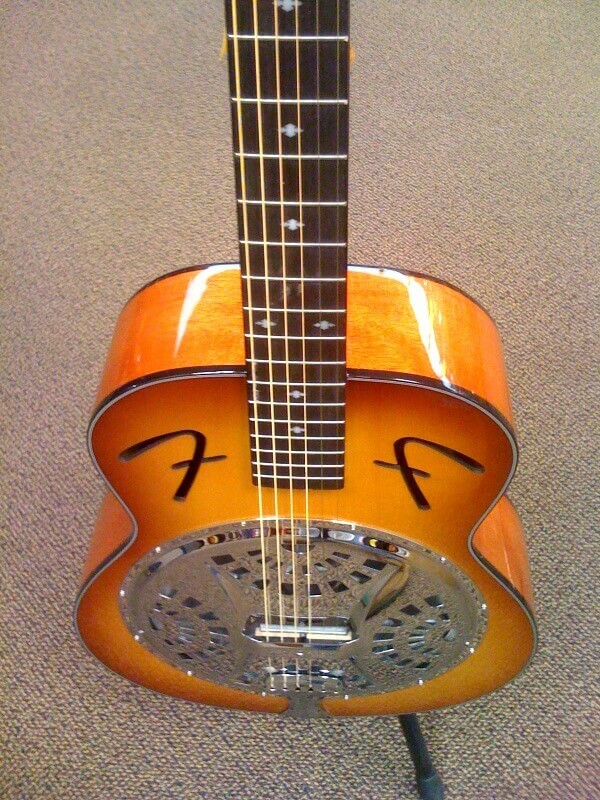 Of note as well in the FR-50 is the brilliant chrome finish resonator and the unique Fender F-holes in the Spruce top. 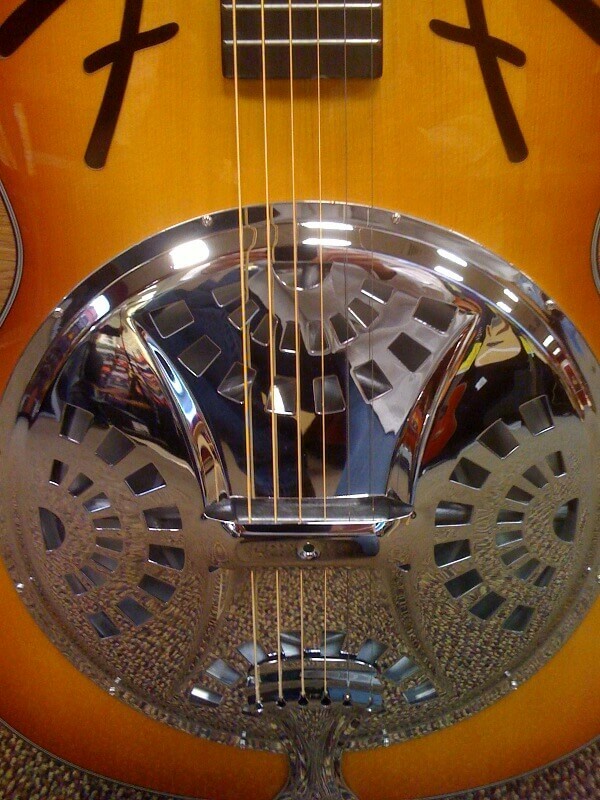 The resonator itself contains a single stainless steel plate which acts as a reverberation or sound projection device in place of a soundhole and gives off a unique sound especially when played with a slide. These brilliant devices were initially employed by guitarists to enhance and amplify their volume, before amplification devices were available. Some say Resonators were used in order to perform at a volume level commensurate with booming horn sections and to create a sound audible to other musicians and audience members as well. 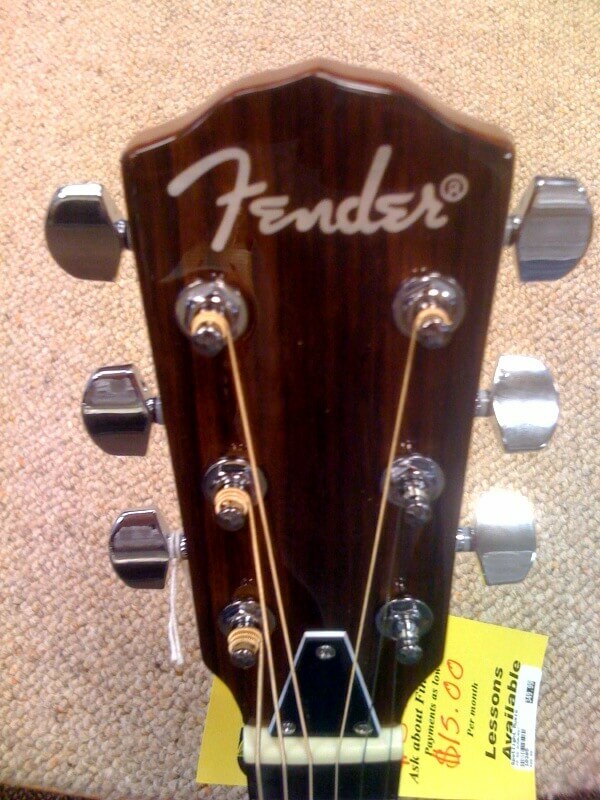 The Fender FR-50 measures 24.75" long and is 3.87" deep. 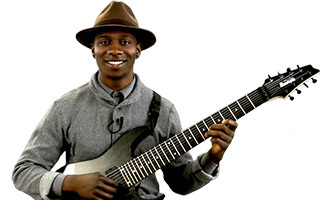 Width at the nut is 1.62" and the fingerboard contains 20 frets, 14 of which are accessible. This particular model boasts the spectacular Sunburst finish and the body of the guitar is sealed in a gloss polyurethane. The FR-50 is currently available for anywhere between $350-$500 either through local music stores or directly through Fender. This particular model is geared more towards an entry to intermediate player who desires the format of the Resonator but doesn't want to lay down a lot of cash. The FR-50 has a distinctive metallic twang and the basic feel of the Resonator. This particular model seems to have used less expensive materials than its more expensive cousins. Subsequently, the sound has a flat quality to it and lacks projection. In fact I felt the overall sound quality was muffled and lacking any real distinctive tonal quality. Yes, the guitar is really cool looking and gives the player the opportunity to emulate old-school slide players, but Fender seems to have compromised sound for raw tangible beauty in this case.